Protect your knives! The Flitz care kit removes and protects against rust and oxidation. Helps keep your gun, knife, or sword looking new! Wax-Premium Brazilian Carnauba & Bee's Wax. Water-based, no silicones, non-abrasive and no buildup. Resists water spots, dust and fingerprints. Polish- Metal, plastic and fiberglass polish. Original paste formula removes oxidation, rust, fingerprints, power residue from factory hot gun bluing, nickel and stainless. Also works great on fiberglass, gelcoat and plastics. Thick & Thirsty Microfiber- Extra thick, use wet or dry. Lint free and machine washable. Stainless Steel & Chrome Clean- Powerful degreasing formula. Anti-smear. Works fast. 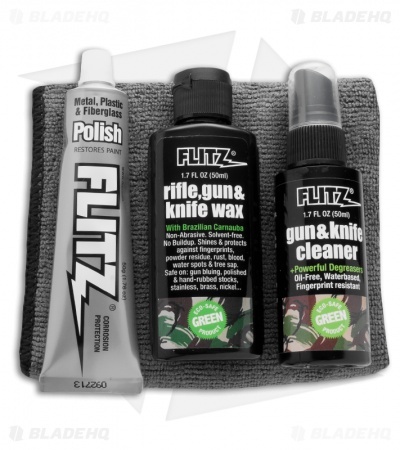 Use on gun bluing, polished/hand-rubbed stocks, stainless or nickel firearms and knives. Safe on interior and exterior of the bore.